Island hop and sail the Bay of Naples in the Tyrrhenian Sea from our new base to explore the wonder of Italy’s Pontine Islands, Phlegraean Islands, Capri and the Amalfi coast. Get in touch to book your dream yacht charter and discover an authentic Italian atmosphere for yourself. The largest city in southern Italy, Naples has one of the world’s largest historic centers and is famous for its UNESCO World Heritage status. With a Mediterranean climate and warm waters between May and October, it’s also a prime spot to sail the Amalfi coast, Capri and the many outstanding nearby islands. From Sorrento to Positano and Ischia to Ponza, this historic coast and archipelagos will enthrall and entertain your crew with nature reserves, delicious Italian food and traces of ancient civilizations. 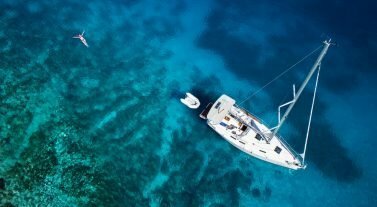 Dream Yacht Charter in Naples: We have a large fleet of catamarans and monohulls in Naples to suit any sailor, whether you’re looking for a bareboat, by the cabin or crewed yacht charter. Our new base is in Pozzuoli, which has a charming ambience and mountainous backdrop. From here you have the perfect platform to explore the city of Naples and its Italian atmosphere along the old town’s Spaccanapoli, the famous long street that divides the city. If you need help planning your charter, check out our inspirational itineraries section. Get in touch with our team to find out more. Advance book or hail licensed taxis and agree the fare before you get in. Make sure you pay only when you get out with your bags and pay what you agreed, as taxis tend to overcharge tourists. Avoid hiring cars as the traffic is heavy and we can arrange airport transfers on your behalf. Italy is within the European Union and US citizens can bring back into the US $800-worth of goods per person duty-free, including one bottle of wine or spirits. The currency is Euros. Visa, MasterCard and American Express are widely accepted but you may be charged a service fee by the local establishment if you pay by card. ATMs are easily found, just look for Bancomat signs for machines with multilingual interfaces. Banks are open Monday to Friday (8.30am to 1.30pm and 3pm to 4pm). Getting online is easy with plenty of Wi-Fi spots across independent cafes and restaurants. The local internet service providers are Libero, Tiscali and Fastweb. Be respectful in religious places and cover bare shoulders with a scarf. Temperatures in the Bay of Naples are around 18ªC to 25ªC between May and October. July and August are the hottest months and temperatures can peak at 30ªC. The chance of rain starts to increase from September. Sailing conditions include a regular southwesterly breeze in the late morning until early evening during the summer. In the fall, winds can pick up and the swell can be heavier in the bay. Day 1: Overnight at Pozzuoli, and make sure you try the Margherita as Naples is the birthplace of pizza. Day 2: Head to Procida after lunch, the smallest island in the bay, and stroll around the colorful harbor. Sail around the coast to Vivara, which is connected to Procida by a bridge. This island is home to a nature reserve with rare plants, rabbits and birds, but check online for opening times. Day 3: Make for Ischia, the largest island in the bay of Naples and a popular coastal destination. Explore the island’s 34km of volcanic coastline and views of Capri. Enjoy its thermal water and spas, mountains and hidden coves. Day 5: Sail 19 nm from Ischia to Capri. Get to know the island’s Faraglioni rocks, visit the Blue Grotto and watch the amazing colour of the water as the sunlight hits the caves or enjoy the ambience at Marina Piccola. Day 6: Enjoy the morning and lunch in Capri and sail back to Ischia. Head to Forio for shopping, Citara beach and Poseidon Thermal Gardens. Day 7: Sail to Pozzuoli, Naples, and enjoy a day exploring Mount Vesuvius, which towers above Naples, or Pompeii to see the Vesuvius National Park and stand on ground that was once destroyed by the disastrous eruption of AD 79. Embark in Marina Maglietta at 17.00 for Inventory, delivery and any insights on the navigation In Area. If at the customer’s choice overnight in the marina or in 1 hour of Navigation and good weather, navigation to Procida, baia di Corricella (8 miles) near the island of Procida. Suggestive Village of Handsome fishermen to visit, excellent bay for overnight stay, sheltered from all the winds North and North West direction. Monday: Procida at about 1-hour sailing, bays Recommended: Corricella, baia di Chiaiolella(9miles) (excellent and suggestive port with possibility of mooring and overnight services on land and excellent restaurants. In Procida you can discover an ancient seaside village, founded in times of the Greeks and Romans, where time seems to have stopped. You will see fishermen repairing nets on the shores along the coast. Also recommended bath in the little island of Vivara. Tuesday: 40 minutes of sailing and you can easily reach the beautiful island of Ischia (13 miles), The greatest of the Flegree Islands. Discover the revitalizing spas and thermal springs of the island of Ischia to which magical healing powers are attributed. To see the Aragonese castle in Ischia Bridge, The whole coast of the Island and in particular the South and South West side is very beautiful and with different mooring possibilities: Ischia Ponte, Cartaromana, SGarrupata and Sorgeto . Don’t miss the village of Sant Angelo and its bay next to the thermal beach of the fumaroles to the billows. Wednesday: Heading north in the direction of Forio you can reach in about 4 hours of sailing the first and Wild island of Ventotene (30 miles), the More South of the Pontine Islands, with its ancient Roman port small but unique located next to the new port do More Easy access. Thursday: At the same distance you reach the island of Ponza(50 miles) with its bays and beaches. Underwater caves, jagged coastlines, fabulous beaches and breathtaking cliffs attract thousands of tourists, divers and sailors who normally choose the Chiaia di Luna beach, a white sandy beach reachable only on foot, surrounded by a Cliff overlooking the sea. Pediment, Easy to reach and not to miss the uninhabited and beautiful island of Palmarola with “possibility of staying overnight according to the weather conditions. Friday: Return navigation to the base with stop for the supply of diesel oil to the marina of Ischia Porto or a few miles to the marina of Procida. Return to base by 6pm or 8/8.30 a.m. maximum to Marina Maglietta. Depending on the needs, weather and duration of the Charter the same course can Also be suitable for 2 weeks with More Suggested visits at the Boarding from the base manager. Sunday: Island of Capri (30 miles): about 3 hours of sailing, to spend a day, Marina di Capri for overnight in high season only with reservation of the mooring. Recommended overnight stay at Marina Piccola except if there are unfavorable conditions with twenty knots direction from South/West. Possibility of mooring at the buoy as an alternative to the Still, nice tour of the island. Monday: Capri. Trekking or walking trip of the cruise. The coastline is indented with numerous caves and coves alternating with steep cliffs. The caves, hidden under the cliffs, were used in Roman times as nymphs of the sumptuous villas that were built here during the Empire. Wednesday: Navigating the Sorrento Peninsula to Punta Campanella in the Straight of Capri. Up to the Bay of Nerano nice and famous for its restaurants. Possibility of overnight at the buoy. First landing of the Amalfi Coast. Thursday: To spend in the Bay of Positano(49 miles) or at your choice in Amalfi (55 miles) The climate in Positano is characterized for most of the year by a pleasant and refreshing sea breeze, which allows you to visit Positano for a period that runs from March to October, despite this, given the huge tourist influx that floods the streets Of the city, it can be difficult to stay in the months of July and August because it is really hot. Among the main things to see in Positano are the typical narrow and sinuous streets, or better stairways that connect the upper part of the city to the beach. Friday: Start navigating back to the base with the possibility of stopping in Capri or Marina di Procida for the refueling. If you choose South option you can continue towards the Aeolian Islands. The first, Stromboli(130 miles), High cliffs broken by small sandy beaches blackest alternating with coves and grottoes, the white Mediterranean houses, the green of the palms, the olive trees, the citrus fruits that rest on a bitter but fascinating volcanic cone secluded in a blue sea intense and can be reached in about 18 hours of sailing from the base of Pozzuoli directly or continuing the tour towards south from Amalfi with some Stops in Punta Licosa (80miles). or stopping at Acciaroli (68 miles) (Marina with services and Gas station) in Cilento coast. Acciaroli is a seaside resort and as such offers its best in summer times. The beaches and the sea are really lovely and suitable for the whole family because the stretch of beach is very wide with soft sand and golden and excellently equipped. However, could be a good choose stopping in Marina di Camerota (95 miles) with coastal navigation (Marina) and Cala Infreschi. Aeolian Islands: Stromboli not recommended mooring with the anchor at night. Distances between the Aeolian Islands considering the island of Central Salina and equipped with a new Marina with services and gas station. Salina/Lipari4 miles. Salina/volcano 6 miles. Salina / Panarea 11 miles. Salina/Filicudi 15 miles. The distances in journey time have been calculated according to an average speed of the boat of 6 nautical miles per hour. Fly direct to Naples via Naples International Airport (NAP), near Capodichino. Our base is located at Marina Sud Cantieri. We can arrange airport transfers on request and the airport is about 21km from our base, or a 25 minute taxi ride. Make sure your passport is in date and valid for the duration of your stay and look under our Handy Info section for visa advice!